The trick to using our Red Velvet Color when baking cakes and cupcakes is to substitute baking powder for baking soda to achieve a bright red color. This simple modification makes all the difference as to whether or not the color bakes out in the center leaving a red-orange, or maintains a bright red throughout the entire cake. Lowering the heat and baking time when possible will contribute to overall color vibrancy. Overheating will cause some color deterioration and increasing the acidity with a little extra vinegar may also help achieve a brighter color result. While we offer a Gluten-free Red Velvet Cake Mix, here is a tried and true Red Velvet cake recipe from scratch. 1. Heat oven to 350 degrees. Butter two 9-inch cake pans and lightly dust with cocoa powder. 2. Mix butter, sugar, eggs and vanilla. 3. In separate bowl mix dry ingredients: flour, red velvet powder color, cocoa powder, and salt. 4. Add vinegar to buttermilk. 5. Slowly add dry blend into butter mixture along with buttermilk/vinegar. 6. Divide batter evenly into 2 pans. Bake for 25-30 min. Cool on rack before frosting. 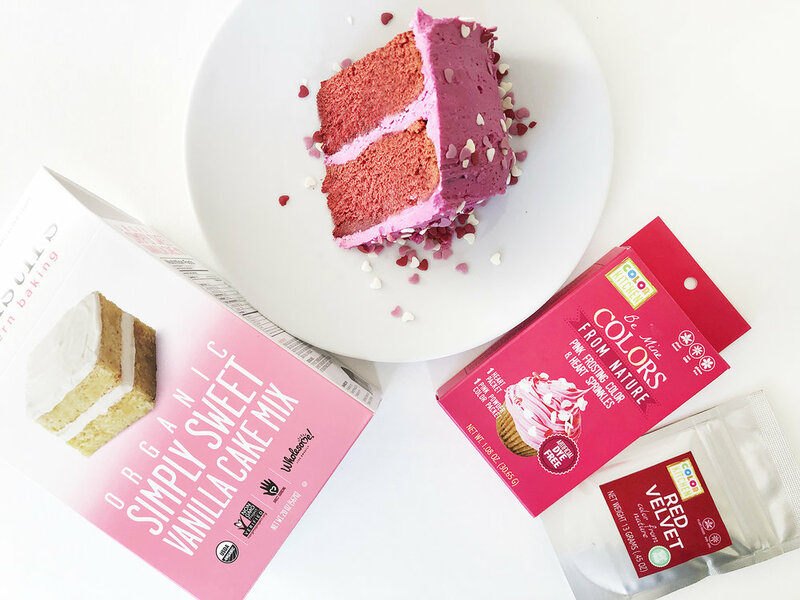 Our Red Velvet color works well with other cake mixes, such as Foodstirs Organic Simply Sweet Vanilla Cake Mix (containing baking powder, not soda). Simply add our Red Velvet color and 3 Tbsp of cocoa powder and blend with dry ingredients. ColorKitchen Red Velvet color creates a wonderfully natural bright red. Use 1 packet Red Velvet color to 1 pint frosting. If making frosting from scratch, blend color with dry ingredients before hydrating or mix color powder with a very small amount of water (approx ¼ tsp liquid to 1 ¼ tsp color) to make a paste. For more shades view our Red Velvet icing recipes﻿.